Dry with a golden colour. Whitbread Golding variety hops provide a fruity bitterness. In casks and bottles. A dry, full flavoured and hoppy beer, using Fuggles and Goldings hops, with a small amount of crystal malt for colour and flavour. Creamy, dry and full bodied, with a toasted, malty nose. Northern Brewer hops and the romantically named TA 200, a new hedgerow variety, are used for more flavour. A light, crisp beer with a fruity hoppy nose and amber colour, using Northern Brewer and Sovereign hops. Strong, with a fruity sweetness and dark colour. Nice falling over beer. Goldings hops for the base and Northern Brewer for the aroma, which also give this a pleasing edge. 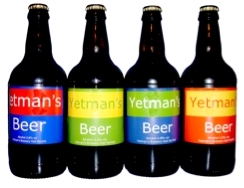 Bronze Medal winer Norfolk Camra Bottled Beer Competition 2015 for Strong Beer. All my bottled beers are bottle conditioned. This means adding a small amount of yeast to each bottle to chew up remaining sugar and carbonate the beer. As the beer is “live” its character will change with age, as more sugar is consumed. Store and serve cool, pour carefully to ensure a clear glass of beer.